Teaneck Doghouse- Open until 3 A.M. While not a restaurant, this is pretty big news. It has come to our attention that the 90 year old Streit's Matzoh Factory in the Lower East Side will be closing. Just one more Pesach and they'll be gone with the rest of the Chametz. Don't worry though, because they are not closing their doors for good. The factory will be relocating to their New Jersey Facility. Anyone looking to buy a former matzoh factory? Traditions, the popular Five Towns eatery is opening a branch in at 543 Kings Highway at the former location of the now closed Brooklyn on Rye. If you want to see what you're in for, clickhere to see the menu at their Lawrence location. Due to difficulty finding a kitchen to prep and store their food, Milt's will not be coming to Florida this year. Next year they will begin the search earlier and have the truck there in early December. A New Kosher Cafe and Bakery opened just a couple months ago. It is located just next door to Smiths in Summerlin. If anyone has more information please let us know. The popular Israeli coffeehouse chain will soon be opening its doors in Toronto on Bathurst and Wilson. The cafe will be under COR supervision and Chalav Yisrael. Hot Latte anyone? COR certified Dr. Laffa has been aquired by a restaurant franchise called 'Famous Laffa'. Non-Kosher locations will be called 'Famous Laffa', while Kosher locations will be called 'Famous Laffa Kosher'. The branding and color scheme will be different, as well as the menus as to not be confused with the separately owned non-kosher 'Famous Laffa'. Famous Laffa Kosher, presently the only kosher 'Laffa' establishment, is located at 401 Magnetic Drive. Dr. Laffa on the Go is also still in operation under COR at 3027 Bathurst Street. The sleek, new sandwich spot in Ontario called Royal Toast is now open for business. Offering delicious paninis, mini hot dogs and hamutzim. You can customize your toast whichever way you like. With a fun atmosphere and quality food, Royal Toast at 1450 Clark Avenue West, Thornhill, Ontario is here to stay! Free glass of wine with dinner on New Years! Offering Schitzel in a Pita or Baguette for $7.95 with coupon. Expires 1/31/15. Not valid for delivery. They will be open on January 1st from 5:00-10:30 pm for dinner. Ring in 2015 with dishes like the Braised Wagyu Beef Short Ribs, with polenta fries, cranberry beans, pumpkin, pearl onions and topped with a pepper aromatic sauce and Maple Glazed Stuffed Hen with savory baby vegetable stuffing, chateau pomme and thyme infused black truffle jus. Creative sushi options are also available like the Sakura Roll, which is filled with salmon, yellow tail, avocado and almonds, wrapped with cucumber and topped with spicy tuna and the Volcano Roll with spicy tuna and Asian pear, topped with avocado, Reserve Cut "special sauce" and tempura. After an impeccable meal, indulge in Vegan Beignets stuffed with dairy-free "ice cream" for a sweet way to start off 2015! 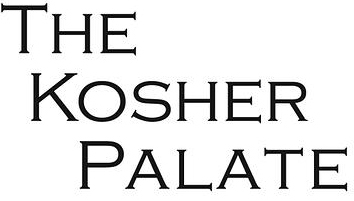 They will be offering their usual live music with no cover charge, 2 large flat screen TVs for those who want to see the action at Times Square, and, of course, delicious Glatt Kosher food! Complimentary glass of champagne at Midnight! For prix fixe menus, click here. 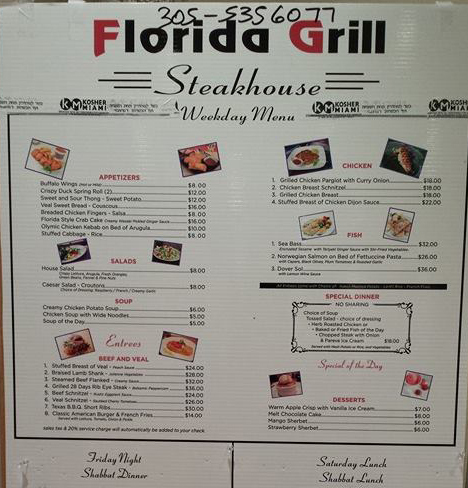 Menus and prices subject to change without notice. Limited a la carte menu may also be available. Will be open all night New Year's Eve! For New Year's Eve they will be offering a complementary glass of wine with your main Course. They are offering a special New Years tasting menu. $85 per person, additional $30 to pair with wine. Click here for the menu. Introducing "New Desserts" in honor of the New Year. They also have plenty of champagne ready for the midnight countdown! This New Year's Eve enjoy a gourmet four course sit down dinner including salad, soup, choice of chicken or fish and dessert. Also includes 1 beverage (beer, wine or soda) and 1 glass of champagne for midnight toast. Additional menu items and full bar available throughout the night. New Year's Eve event always sells out, only 90 seats available! Prizes & Raffles! Celebrate New Year's in RARE Fashion! Champagne Toast at midnight for all. Call 305-532-7273 for reservations. Join them on Wednesday, December 31st, 2014. Regular Dinner from 5-7pm.Then Special Seating from 9pm until 1am...Special Menu Live Music With John Usry and his Band "The Fast Lane"
Top 40's, Motown, R & B, Jazz then Champagne and More Fun. Click here for a video on how to order appetizers. The American Classic... with wild mushroom & onion stuffing, herbed gravy, whipped sweet potatoes and cranberry-orange sauce. Additional Children's, Sushi, Wine and Dessert menus will also be available. Vegetarian selections will also be offered. Children's Menu for 12 years old and younger. Thanksgiving Hours 1:00pm-10:00pm. Click here for their Thanksgiving menu. Enjoy a delicious Prix Fixed Thanksgiving menu available all day at Eighteen. Main and sushi menus also available! For reservations call (212) 517-2400 or email info@eighteenrestaurant.com. Click here to see their Prix Fixed Thanksgiving menu. They are also open Saturday night with a new Bar menu with lighter dining options. They have a huge list of takeout specials for Thanksgiving. Call before November 21 and get 10% off. Click here for their entire menu and ordering information. They are offering a special Thanksgiving menu. Click here to see the entire menu. They also are available for corporate parties, you can see the flyer here. (plus tax and tip) you can enjoy a salad, choice of soup, choice of entree, choice of dessert, and coffee or tea. Click here for the full menu. They are also offering Thanksgiving delivered to your home with two price options,, you can see that menu here. They will have a special Thanksgiving Takeout menu which you can see here. They are offering a 3 course meal for $42 with a choice of dessert or a glass of wine. Click here for the menu. Special early openings, every Sunday at 4 PM. Enjoy their new menu as well as a full line of charcuterie and an even larger selection of steaks. Thanksgiving Hours: 4:00pm-10:00pm (And welcome their new chef, Chef Lin). Fall in love with your favorite Prime eateries all over again as they break out their exciting winter line up of menus, packed with fresh new creations that will make you want to embrace the cold weather. They are offering four different Thanksgiving packages in all price ranges. Click here to see them. They are offering six flexible seating times for the Thanksgiving meal and will have 3 prix fixe menu options - $38, $55, $66 per person. Kids menu is available at $30 per child (10 and under). Click here for the entire menu.Catering packages are also available. Entree:King Salmon poached in vanilla and truffle oil, salmon roe caviar, preserved lemon, mushroom terrine, red wine reduction. They are once again open after undergoing renovations and they have a newly redesigned menu especially for Fall. Click here to see their entire new menu. Thanksgiving Special: Free glass of wine with any dinner. They are offering a prix fixed menu including soup, salad, main course and dessert plus a soda all for $45.95 per person. Click here for the menu. Click here for their Thanksgiving menu. They are offering a prix fixed Thanksgiving menu with a choice of appetizer, entree and dessert all for 21.95 per person. Click here for the menu. They also are offering a daily lunch special for $12.95 click here for the menu. Order online and save money! 10% off every online order enter coupon code "FP18" and save instantly. Click here to order. Their Thursday night buffet this week will include many Thanksgiving favorites such as carved turkey at their carving station with stuffing, glazed yam and cranberry relish along with their other savory buffet items, all you can eat for only $19.95. Click here for their ad. They will be having a prix fixed Thanksgiving feast with a choice of appetizers a delicious entree and a choice of delectable desserts all for $35 per person, Children 10 and under $16. They are offering a some amazing Thanksgiving specials in addition to their already incredible menu. Click here to see the specials. Thanksgiving special: Free dessert with any dine in dinner. They are offering 15% off of all sushi rolls on Thanksgiving. They are offering whimsical confections such as a turkey cake that feeds 30-35, turkey and pumpkin shaped vanilla bean cake pops, and Chanukah themed cakes. Click here to see pictures and prices. Click here for their new menu and here for their new dessert menu. $28.00 per child plus tax and gratuity for schnitzel and french fries with choice of dessert. Clickhere to see the entire Thanksgiving menu. They will have an all-you-can-eat buffet for Thanksgiving with a variety of Beef, Chicken, Turkey, Vegetable and many more appetizing dishes. Buffet will run between 12-3pm, and then again from 4-7pm. Adults $24.95, children under 12 $15.95. Reserve now as space is limited. They also have a Dinner Buffet every Monday night, from 6:00-9:00 pm $19.95 per person featuring vegetarian dishes,meat dishes ,mixed Indian breads,rice specialties, Indian chutneys and salads. Their Thanksgiving menu can't be beat! For $315.00 you get everything you need - soup, Turkey- smoked, roasted or fried, cranberry sauce - fresh cranberries!, gravy, real gravy- not from a packet, starchy sides and vegetables sides - they even have kale this year. Or you can order each dish individually from their mouthwatering menu which you can see here. You can even orderonline, from the comfort of your home. They will also be accepting reservations for Thanksgiving day from 12:00pm-7:00pm, for a pre-fixe menu, virtually identical to their takeout package. Space is limited and reservations will fill up quickly. Call 201-836-7427 to make your reservation. Thanksgiving menu available. For $35/Person Dining In, and $32/Person Take Out. Course 3: Main dish: Roasted Turkey with Bread Stuffing,Mashed Potatoes OR Mashed Sweet Potatoes, String Bean Almondine,Cranberry Sauce. Course 4: Choice of Pumpkin Pie or Apple Strudel If ordering take out, please order by 11/24. They are also delivering to Lower Merion area at $5 per delivery. They will be offering a traditional Thanksgiving meal with choice of soup or salad, a Thyme Roasted Turkey, gravy, stuffing, sides, rolls, soda and dessert all for $38 per person. They are offering a prix fixed menu featuring a choice of appetizer, entree and dessert for $85 per person plus tax and tip. There are also add on options. Click here for the menu. 1 1/2lb. homemade cranberry sauce, 2lb stuffing, 2lb mashed potatoes,2lb green beans, 8pc pumpkin bread pudding. Feeds 6-8 people. Additional turkey is $100 more. Click here for the menu. Please call 773.661.6384 for more info or email catering@Miltsbbq.com. Requires 48 hour notice. They are offering wonderful pumpkin pies, cherry pies, apple pies, pecan pies and much more! You can find more details to pre-order your pies here. They are offering a prix-fixe menu featuring a choice of soup, salad, appetizer, entree (there is even a vegetarian tofu-tempeh turkey alternative) and dessert for $45 per person plus tax and tip. Orders are due by Friday, November 24. Click here to see the entire prix-fixe menu. They are catering Friday night dinner and Shabbat lunch at the Beth Jacob Congregation Scholar in Residence Shabbaton on November 21st and 22nd in San Diego. Click here for the flyer and menu. RSVP online www.bjsd.org/events or by phone 619-287-9890. They will be featuring a special Prix Fixed Thanksgiving Menu with choice of salad, soup, entree and dessert all for $46 Per adult and $32 per child (ages 5-12) plus tax and tip. Click here to see the entire menu. They are also offering many Thanksgiving take out options. Click here to see the menu. They are offering a Prix Fixed Thanksgiving menu, that will be served from 3:00-9:00 pm, featuring a choice of appetizers, entrees and desserts plus coffee or tea all for $49 per person, children under 12 $29 plus tax and tip. Click here to see the entire menu. They are also offering many delicious take-out options which you can see here. They have a mobile succah. They have a very large succah. They have a succah. It seats 18 people only and because of the small size they will not take reservations for the seats, first come, first serve, and the entire party must be complete to be seated.Full regular menu is available out there with waiter service. They have a succah with waiter service. They have a succah and will be opened Sunday-Wednesday of Chol Hamoed. They have 130 seat succah with breathtaking views as well as a private succah on the rooftop that seats 30 people. They have a succah. Full regular menu, with waiter service. 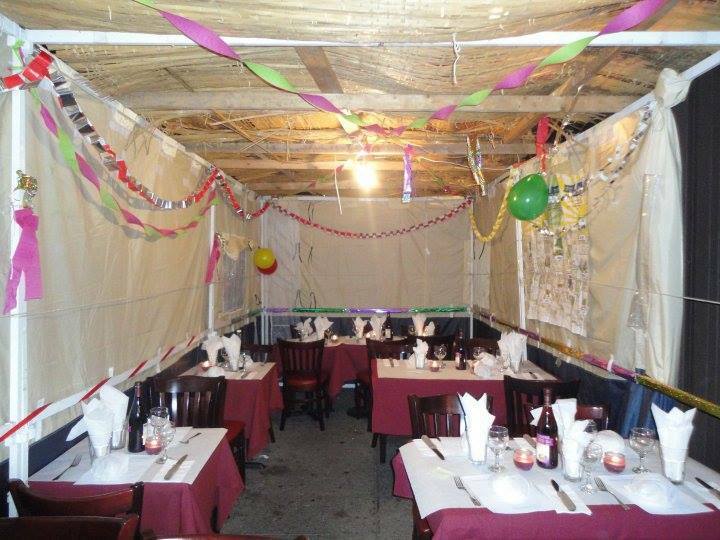 They have a succah (click here for photo). They have a succah all week long including Shmini Atzeret/Simchat Torah- offering 3 pre-paid, prix fixe menu options: $37, $50, or $65, all inclusive + sales tax. 2 seatings for dinner: Early bird dinner 5-8pm (flexible) and dinner 8-11pm (flexible). Lunch will be served 12PM to 3:30PM (flexible). Click links for their Lunch and Dinner menus as well as Friday night Shabbat menus. Menus subject to change without notice. Click here for their succah. They have a succah that seats 20 people. Full regular menu, with waiter service. Open on Chol Hamoed, but do not have a Succah. They have a large succah- seats 40 people (click here for photo). They have a succah- seats 20 people. Closed on Succos. Like their Facebook page and comment on your favorite dish for a chance to win a $50 gift certificate. Contest ends October 19. Can a muffin help you lose weight? Click here to find out. Perfect for succos- all muffins are shehakol. They have a large succah. You can see a video of it here. They have a succah with 2 tables. They have 2 succos to seat 40-45 people. Click here for photo of their succah. Full regular menu, with waiter service. They are also debuting a new menu, which you can see here . They have a succah-seats 40 people. Full regular menu, with waiter service. They have a succah in their back parking lot. Seats 15-20 people. They have a succah that seats 25 with waiter service. Like their Facebook page and comment on your favorite dish for a chance to win a $50 gift certificate. Contest ends October 19. Facebook page and comment on your favorite dish for a chance to win a $50 gift certificate. Contest ends October 19. They have a succah that seats 50 people with waiter service. Like their Facebook page and comment on your favorite dish for a chance to win a $50 gift certificate. Contest ends Oct. 19. They will be closed for Succos. They have a small succah. They have a large succah. They will also be having a barbeque and a special eat in and take out menu that you can see here. They have a succah. Free delivery all day ($25 orders). Hot dogs $1.50, French fries or onion rings $1.99 open 12:00pm-2:00am! They have a new larger succah that seats 80 people. Offering a special Chinese Buffet in the succah Sunday,Monday,and Tuesday chol hamoed 5-10pm. Full menu with waiter service also available. They have a succah with fans and music. They have a succah that seats 16 with waiter service. They both have a succah. They have a succah-seats 20 people. They have a large succah- seats 50 people with waiter service. So we reported this yesterday in our newsletter, but we heard from the owner of Siena Ristorante, that the location which used to be "Back to Nature" (which they also own and is next door) is under renovation and will now be a vegan restaurant. The restaurant, located at 535 Kings Highway, should be opening up in a few weeks. 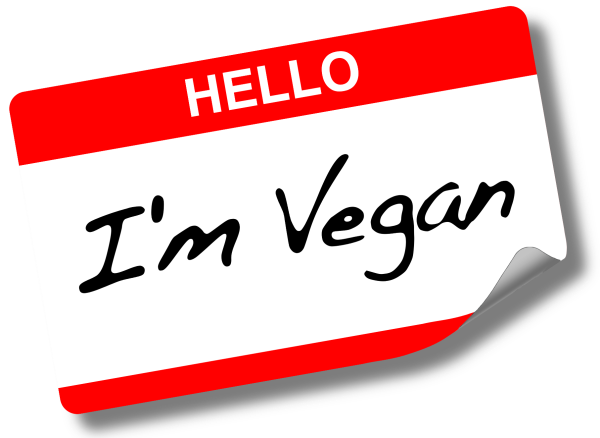 This is quite interesting since there are almost no vegan kosher restaurants that are Shomer Shabbos and under orthodox rabbinical supervision. We're not sure if the name will remain, but if it doesn't, it would mean the end of almost 20 years of "Back to Nature" one of the first dairy restaurants that catered to the health conscious crowd. Join Eighteen Restaurant for prepaid Rosh Hashana Meals. Available for both September 24 at 8:00 pm and September 25 at 8:15 pm. $70 per person and $45 per child (ages 4-10). Space is Limited. Call (212)-517 2400 or email them. They also have holiday catering available, clickhere for the menu. Note: they have hotplate available for your Shabbos meal. Daily mincha minyan at 3pm. Click links for their new lunch and dinner menu. 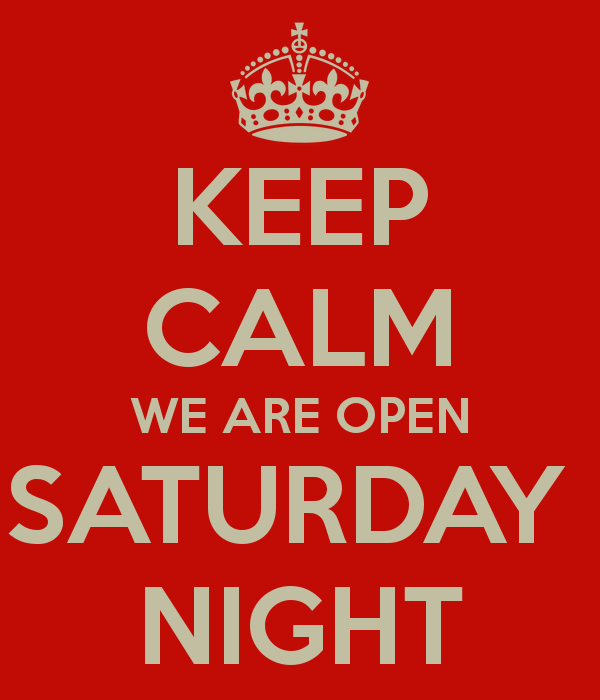 Now open on Saturday night - 1 hour after Shabbat until 12midnight. Available for private events and large group reservations. Click here to see their Rosh Hashana Holiday menu featuring many signature dishes, as well as many Rosh Hashana classics. For almost 12 years Talia's has been serving Rosh Hashanah lunch & dinner meals. They are offering 3 pre-paid, prix fixe menu options: $37, $50, or $65, all inclusive plus sales tax. Families and groups are welcome. Talia's will offer two seatings for dinner: Early bird dinner 5:00pm to 8:00pm (flexible) and dinner 8:00pm to 11:00pm (flexible). Since Jewish law forbids the distribution of money on Shabbat and Jewish holidays, gratuity is banned. Prices charged are all inclusive and no part of the price is purported to be a gratuity. Only sales tax shall be added to the bill. Indulge in a sizzling steak right off the grill while sipping mixed drinks from Talia's full bar such as vodka cranberry, apple or chocolate martinis, cosmopolitans, etc. They will be having a full Rosh Hashana and Succos menu. Go to their page for more details. Can a cookie really help you lose weight? Click here to see their weight loss cookie flyer. All You Can Eat Lunch Buffet with fish, sushi, pasta, salad, soup, vegetables and more. New to Forest Hills Location: Teriyaki Grill! Japanese Meat & Chicken. Click here for that menu. A special coupon today for their restaurant guests. A free glass of wine or beer with the purchase of any entrée. Just print this coupon and present to them on your visit. And as family friendly restaurant with crowd-pleasing menu options for children, print thiscoupon and redeem between now and September 24th for $2 off any item on our children's menu. Click here for a video short of their restaurant. Only one week left to place your orders. Click here to see their special Rosh Hashana Menu. Butterflake is offering free home delivery for Rosh Hashanah to the upper west & upper east side! Extreme Catering by Rare will be the caterer at the Rosh Hashana and Yom Kippur program in Fort Lauderdale as well as on Succos at the Atlantis Resort in the Bahamas. Click here for details. Click here for their Rosh Hashana takeout menu featuring appetizers,soups, entrees and more. All orders must be placed by September 18th. Offering a four course prix fixed menu including soup, appetizer, main course, side dishes and dessert all for the incredibly low price of $35 per person. Click here to see their entire Rosh Hashana menu. Order must be placed by September 21st at 5:00 pm. Starting now, select merchandise in the Herzog Wine Cellars Tasting Room is being offered at huge discounts for the Holidays! Everything from housewares, home decor, wine gift sets, men's gifts and more! Take advantage of these deals while supplies last. Offer valid on marked in-store items at Herzog Wine Cellars only. Offer cannot be combined with any other discounts. Must be at least 21 years old to purchase alcohol. Offer ends 10/31/14 or while supplies last. It's That Time Again...SAVE ON THE SHIPPING! $9.99 shipping rate is charged per box on all orders received through 9/30/14. Maximum box size is 12 bottles. Book ahead and save BIG on your 2014 Holiday events at Tierra Sur! Book your event now through September 30th, and they'll take 20% OFF of your total event cost. Dinner parties, private lunches, office events - all at a 20% savings now through September 30th. For more details and to make your reservations, please email Jonathan Auchterlonie. NOTE: Party reservations must be for a minimum of 20 people. Reservations must be made before 9/30/14, and be made for events occurring before 12/30/14. Offer may not be combined with any other discount. Featuring two Rosh Hashana take out speacials, as well as an extraordinary array of many Rosh Hashana favorites from their take-out counter. Click here to see the menu. Why wait for our newsletter? Make sure to follow us on Facebook, so you can get these restaurant updates even faster. 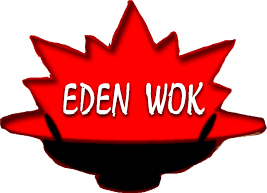 Despite reports from another website that Eden Wok in New York City was closing, we have spoken with ownership who have confirmed that the story of their decision to close was a false report. This is an unfortunate situation where misreporting has actually hurt their business with companies hesitant to book their holiday parties with them and negatively hurting their reputation. We urge that site (despite multiple requests from the owner) to send out a retraction to their readers. We broke this story on our Facebook page a month ago, but over a dozen Dunkin' Donuts in New York City now have select kosher donuts and bagels available under the kosher supervision of Rabbi Aaron Mehlman. The stores themselves are NOT kosher; however, their bakery items are produced at a strictly kosher commissary. A current and laminated certificate (click here) must be displayed before purchasing products. Click here for a listing of the 18 new kosher Dunkin' Donuts throughout downtown, midtown and the East side of Manhattan. we have learned that Lox Cafe on the Upper East Side will no longer be opening. After U Cafe closed earlier in the year, this leaves the area with very few dairy options. We have known this for some time, but we can finally and officially announce that Amsterdam Burger Co., the popular gourmet burger restaurant owned by Mike Gershkovich and Marty Katz on the Upper West Side, has acquired the Mother Kelly space at 490 Chestnut Street in Cedarhurst (across from LIRR) and will be open by the beginning of 2015. Stay tuned. Don't count out the delicatessen just yet. We stopped in to Brooklyn On Rye which recently opened at 543 Kings Highway (off East 4th) as owner Yaron Harazi is bucking the trend of sushi and fusion style restaurants. 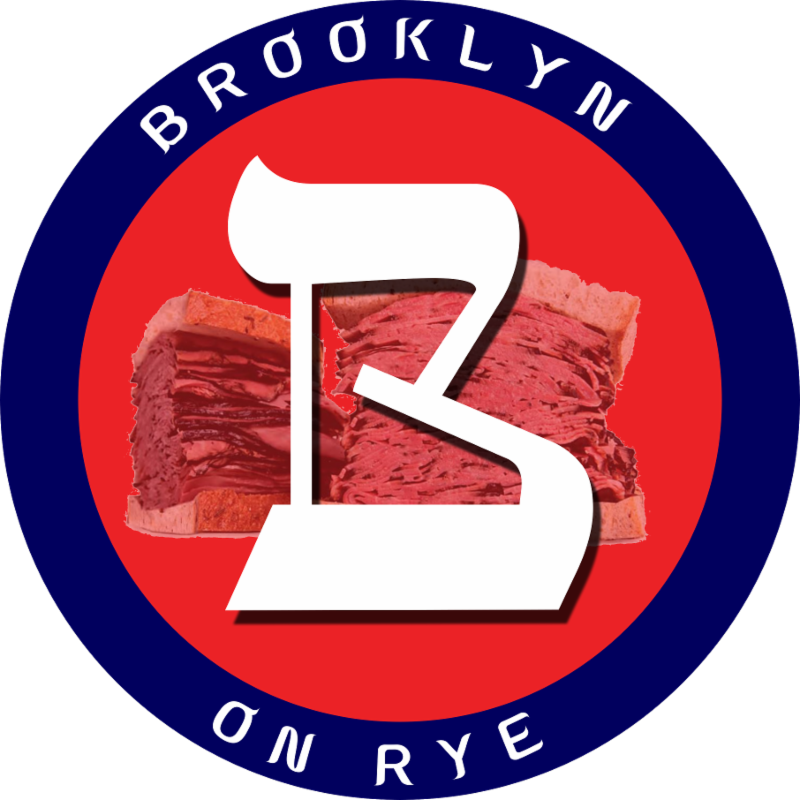 Yaron has been in the meat and deli business for almost two decades and is excited to be bringing his "Brooklyn on Rye" to the neighborhood. Besides all your deli favorites, they also offer a salad bar, schawarma, schnitzel, burgers and more. Click here for photos. 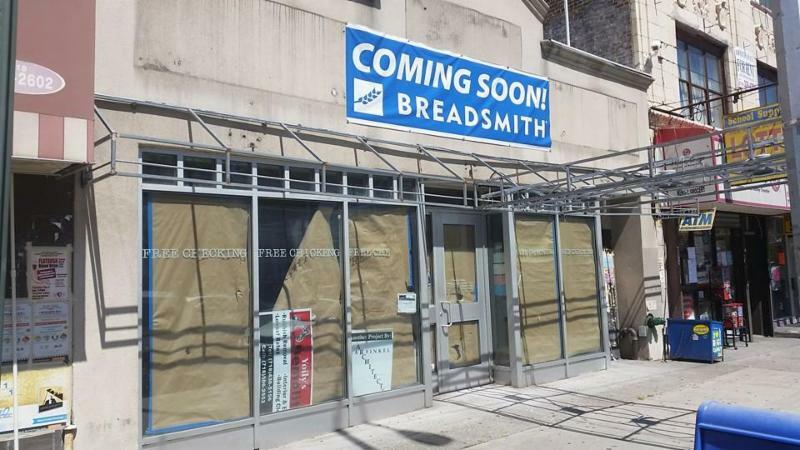 In what can only be called a bizarro situation, a food establishment is actually REPLACING a bank on Avenue M.
Breadsmith will be opening at 1817 Avenue M in early November, coincidentally next door to Kaff's Bakery. "Great Kosher Restaurants" spoke to the owner Chaim Lieff and he is very excited about his place and believes this will revolutionize the bread industry, especially kosher, in New York. Breadsmith, founded in 1993, has over 30 independently owned retail bakeries, with this being the first location in New York. Chaim grew in Minnesota, where there is a kosher Breadsmith (there are others kosher ones, including Chicago) but when he moved to New York 5 years ago he felt there was nothing like this here. Chaim is quick to point out that this is not a bakery and it will not have birthday cakes. Breadsmith specializes in handcrafted artisan breads made fresh from scratch using the highest quality ingredients with no additives or preservatives. They say their dough is never frozen and their breads are baked in six-ton, stone-hearth ovens imported from Europe (the Brooklyn location is getting their oven from Italy). They also make specialty breads and a wide range of challah, cookies, muffins and sweets. Breadsmith has received accolades for their European-style breads including top honors from Bon Appétit magazine, Modern Baking, International Culinary Salon, National Restaurant Association and "Best of" awards throughout the country. On their website, they state they are not just another chain store but a neighborhood store. The website goes on to say that they are "focused on being community-based by taking part in local events and causes on a regular basis. We not only sell an affordable luxury, but we also donate our time and products to those who are in need of it. Each location donates day-old bread to shelters and soup kitchens, as well as generous gift certificates and bread orders to assist local fundraisers." 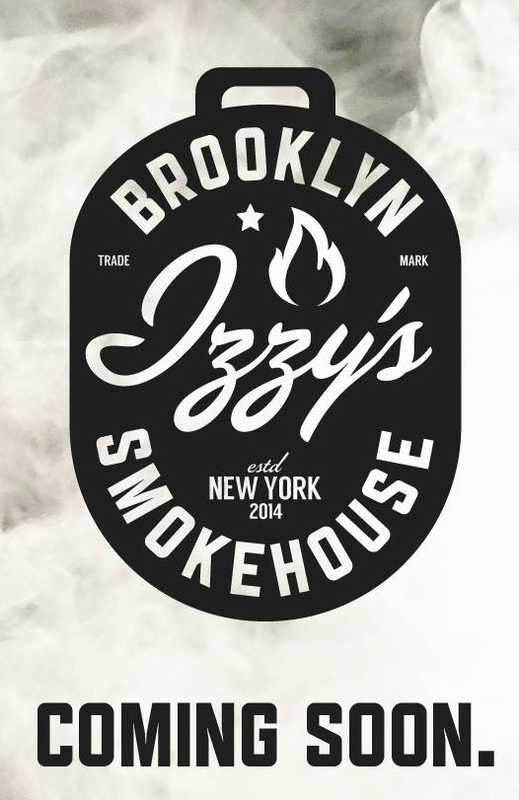 The last time we checked in with Sruli Eidelman of Izzy's BBQ Addiction, he was looking for a name for his not-yet-opened restaurant. Well, he's got that and a new logo. Sruli tell us he will be up and running for any catering right before Succos and that the official grand opening will probably be right after the holidays. His location will be at 397 Troy Avenue in Crown Heights with seating for about 25-30 people. 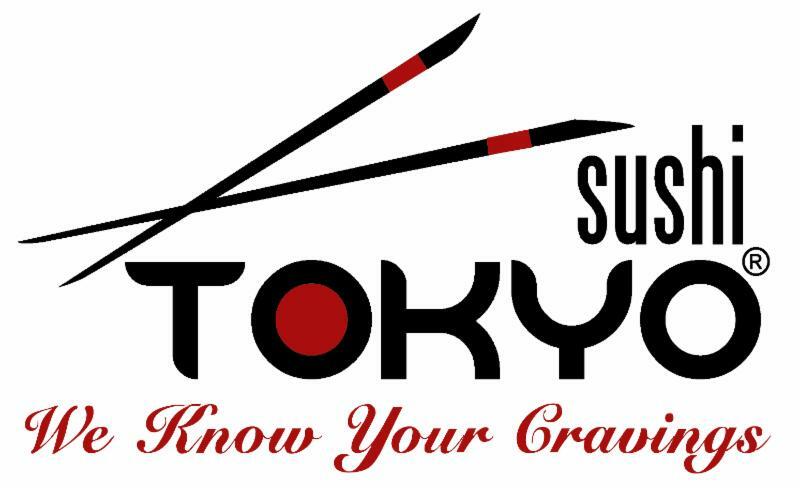 We were recently informed that Sushi Tokyo, with locations already on Kings Highway and Coney Island Avenue in Brooklyn as well another location in Lawrence, will soon be opening up in Queens on Main Street, next to Carlos and Gabby's. The restaurant will be casual in nature and will feature all of their popular and renowned sushi rolls and dishes. Expect the opening to be in a few months. Sushi lovers will say there can never be enough sushi restaurants and we couldn't agree more. NEW: De E Sushi at 73-01 Main Street in Flushing opened 2 weeks ago, specializing in Thai and Japanese Food. Under Vaad of Queens. Click here for their regular and sushi menu. Hours: Sun 7am-8pm, Mon-Thur 6:30 am-9 pm, Fri 6:30 - 4pm. We love these stories. The long-standing Mediterranean Great Neck fish restaurant, is now kosher and under the Vaad of Queens. Turquoise Kosher Restaurant first opened across the street from the Great Neck LIRR station in 1999. It was purchased in 2010 by Erica Bushkin, who moved the restaurant in 2012 to its current location at 76 Middle Neck Road. 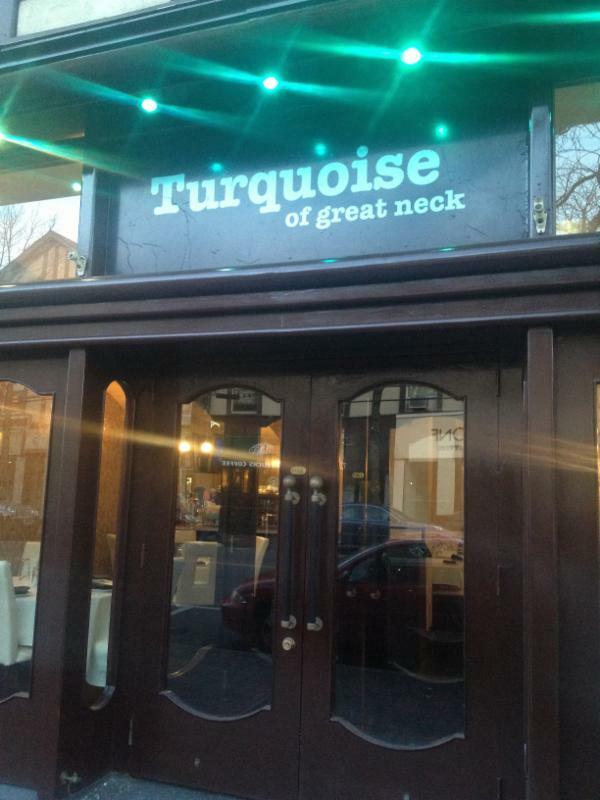 In making Turquoise kosher, Bushkin was responding to Great Neck's growing kosher clientele. "The town is becoming more religious," she told Newsday. "You have to change with the times." What hadn't changed, she added, was the kitchen crew. Please note: This establishment is not to be confused with the Turquoise on Union Turnpike in Fresh Meadows. "Doghouse Sports Restaurant" Opening Today in Teaneck! 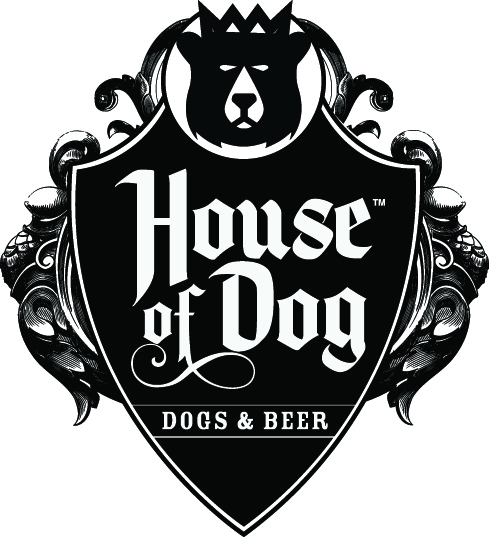 The Doghouse has arrived and it certainly is a one-of-a-kind eatery in Bergen county. It serves as the only KOSHER Sports Restaurant that also offers alcohol. They have 28 TVs (including 2 in the bathroom) and the ability to show all sporting games and events in a family friendly sports viewing environment. They will be open from 11am until 1am or later, in order to show west coast games in their entirety. 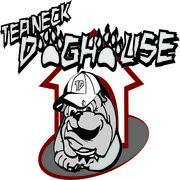 The Teaneck Doghouse is a place where the whole family can come, eat, drink, and have fun watching a game and hang out. So join them - family, friends, and town officials at 3:30pm for their ribbon cutting ceremony, with the opening immediately following at 4:00pm. Then stay around for the NFL Season Opener Green Bay Packers vs Seattle Seahawks. Coverage begins at 7:30pm and Kickoff is at 8:30pm. Ask about their wing special during the game and all NFL Games this season. Click here for a picture of their dining room and bar. They are located at 1415 Palisade Avenue (201-530-7733) and are under the supervision of Rabbi Zushe Blech of Monsey. 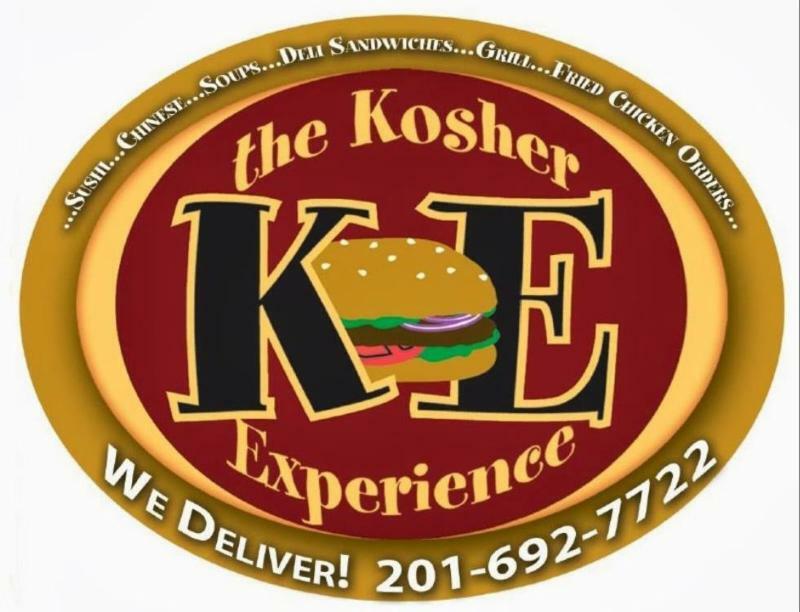 A letter was emailed last week to the community from the owners of Kosher Experience that after 11 years of serving the Bergen County area, they are closing the retail section of the restaurant (they closed Wednesday night August 27). They are moving to Clifton where they will have both Dairy & Meat Kitchens, so that they can continue to service all of their school programs, after school programs, Bar/Bat Mitzvahs and any other simcha. You can reach them at 201.692.7722. Their new location offers a party room that can seat up to 140 people and is located at 306 Main Ave, Clifton NJ. They thank all of their customers and friends for the "many years of loyalty and business." HoC founders, Ruthie and Ron Bzdewka were the big winners of Food Network's Cupcake Wars and now you can finally have them. They have turned kosher and with so many flavor combinations and themes from which to choose you can now order cupcakes for any occasion. Kids love having these individual cakes for their birthdays but the latest trend has been serving cupcakes for more formal occasions like showers and weddings. They offer over 30 flavors of cupcakes as well as other sweet indulgences. This location has a kosher ice cream store and at present, only THIS LOCATION is certified kosher. Wayne, NJ is just a short drive from other Jewish areas like Passaic, West Orange and Teaneck. Brentwood Plaza Shopping Center, 1655 Route 23 South - Unit 17A, Wayne, New Jersey 07470. (973) 832-7285. Under the supervision of Rabbi Aaron Mehlman. and a blind item, which successful chain restaurant is looking to come into the Teaneck area? Jacksonville exploded onto the kosher scene last night with the grand opening of House of Dog, a Miami-based franchise catering to the hip and hungry. Featuring specialty cuts of meat, chicken, and their proprietary beer-infused sausages, HOD combines your favorite sports bar with your favorite caloric infusions. Conveniently located right off the I-95 (just 2 hours from Savannah or Orlando) the address is 10950-36 San Jose Blvd. Jacksonville, Florida 32223. Phone: (904) 674-8364. They are under the supervision of the Vaad of Jacksonville, which interestingly enough, was created for the sole purpose of HOD. Click here for pictures of their opening and click here for their menu. EXCLUSIVE: We have the new name of Baruch Sandhaus' (of Rare fame) other new Surfside restaurant. Besides his Crimson place which we told you about here (which is opening Thanksgiving time) look out for "The Backyard" Q & Brew (think great bbq), located at 9460 Harding Avenue also in Surfside, opening soon after Succos. Fresko is taking over the location of Ike's Diner at 9476 Harding Avenue in Surfside. Ike's, whichwas a retro dairy diner, has been opened for just a year but never really took off in the area, closed this week. After Labor Day, for the months of September and October, the restaurant will be under renovation with a new fresh look that Fresko is known for. They will be open for the season come November time. The new Fresko will feature a similar menu to the one they have in Aventura and will also be waiter service. This just strengthens Surfside as the dominant area (where the kosher places just stretch over 2 blocks) for upscale kosher dining as 3 new restaurants are opening soon (Baruch Sandhaus' two new restaurants as well as "26" - which took over Lotus). Together with Harbour Grill, Kosh and Cine Citta, you are left with abundance of exceptional restaurants. But wait there is more...Fresko will also be opening a Fresko Express in the Chase Building in the Aventura Mall, also in November, which will feature a lighter version of their menu with sandwiches and sushi. The Miami Herald reported last week that Dunkin' Donuts has opened its second kosher restaurant in South Florida, at 3951 Stirling Road Phone: 954-842-3719 The report goes on to say that to receive kosher status, the Dunkin' Donuts restaurant altered its menu to adhere to the dietary needs of its kosher guests by refraining from selling non-kosher products, such as ham, bacon or sausage made from pork. It also adhered to special kitchen equipment and storage requirements. The Hollywood location will offer vegetarian sausage and bacon as an option for its breakfast sandwiches, Dunkin' Donuts said. The new restaurant is open from 5 a.m. to 10 p.m., seven days a week. The franchise is owned by Broward Donuts, which operates 21 Dunkin' Donuts restaurants. They are under the ORB, with the supervision stating that they are dairy (cholov stam), pas palter. Nationwide, nearly 50 Dunkin' Donuts franchise have responded to community needs by obtaining kosher certification for their restaurants, the company said. The first kosher Dunkin' Donuts in South Florida is in Miami Beach. "Great Kosher Restaurants International" has also learned of the following new restaurants that opened over the past summer ranging from Hallandale Beach to Boynton Beach, all under the ORB. - L'Chaim Restaurant- Now under Shomer Shabbos owner and management. 826 W. Hallandale Beach Blvd., Hallandale Beach 33009. Phone 954-404-9102. Pas Yisroel. - Pita Star- 5800 Stirling Rd, Hollywood 33021. Phone 954-981-7710. 706 W. Boynton Beach Blvd., Boynton Beach 33426. Phone 561-509-7599. Now under Shomer Shabbos ownership and management. Pas Yisroel. In addition, Gainesville Hillel at 2020 W. University Ave., Gainesville, FL 32603, is no longer under the supervision of the ORB. With the success of Grill House in Miami Beach, Chef Shimi Alon proudly announces the grand opening of his newest venture, "Grill House Express"
in the Somerset Shoppes Plaza. Alon's goal has been to bring his passion for food to the south Florida community and has now brought his inspiration to the fast food industry. Location: 8903 Glades Road (Suite G9), 561-419-8434, Under Kosher Miami. Rami's in Brookline got approval from the Board of Selectmen to open "The Place Next Door,"
a kosher vegetarian restaurant right next door to their casual dining Israeli/Middle Eastern restaurant on Harvard Street in Brookline. The Place Next Door will be taking over the former beauty supply shop at 326 Harvard Street. Rami's also hinted onTwitter that they might be launching a food truck serving falafel within the next couple of weeks. Rami's, which has been open for nearly 2 decades under the supervision of KVH, Chabad Rabaanim (Kashruth Commission). now opens Artisanal Sandwich Shop in Redondo BeachNot to be confused with the cookbook bearing the same name (different spelling), "The Kosher Palate" is The Pacific Coast Highway's first glatt kosher restaurant. Originally just a food truck (opened in 2012), The Kosher Palate opened over this past summer as an artisanal sandwich shop specializing in traditional Jewish cuisine with a twist. About 40 minutes south of Los Angeles (looks like it's worth the drive), TKP features a customized menu with various bread, meat, veggie and condiment options. You can build your own or go for one already on the menu. At TKP the food is seasonally created and locally sourced. The restaurant is Pas and Bishul Yisroel and all meat is Lubavitch Shechita. Meanwhile, the food truck location changes often, so it's best to follow them on Facebook. Click here for their food truck menu. They also rotate at different markets, bringing their Kosher fare to many parts of LA. For all the information, click here. 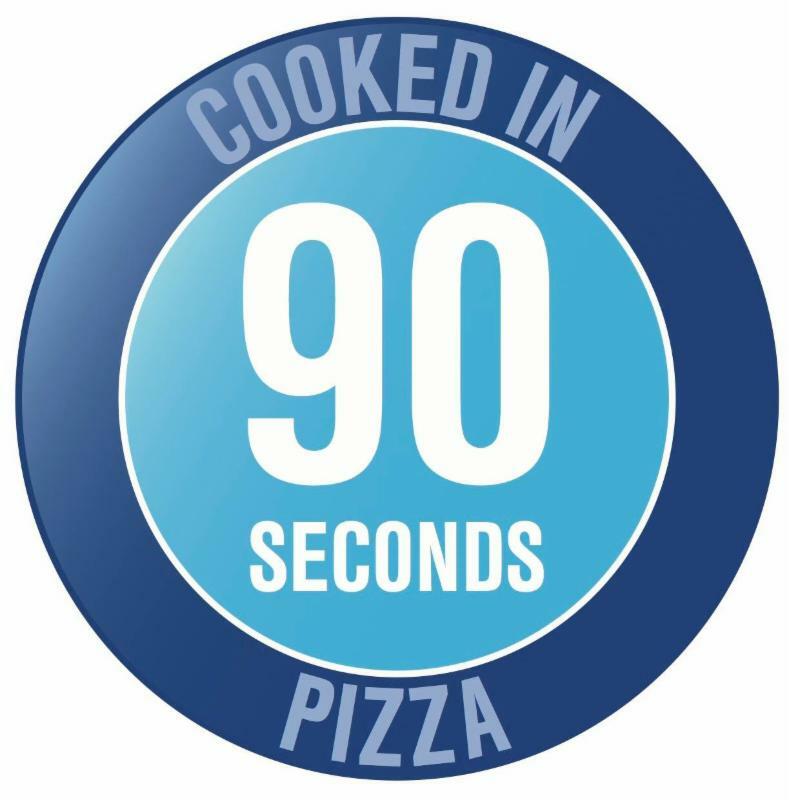 Cooked in 90 Seconds Pizza Laurent Masliah is back in LA! The former owner of Cow Jumped over the Moon and La Seine has been busy in New York this past year, opening and running Pizza da Solo, the Neapolitan style pizzeria in the Sony Building owned by Joey Allaham. There Laurent worked with well known chef Giulio Adriani in bringing this very unique pizza to the kosher market. Well, fast forward a year, and Laurent and Giulio have partnered up to open "Cooked in 90 Seconds Pizza" in Los Angeles, which basically tells you how long you will have to wait for your pizza. The pizzeria will offer a very similar menu to Pizza Da Solo, consisting mainly of 10" inch thin crust pizza with fresh homemade mozzarella, cooked in a wood-burning oven at a very high temperature (1000°F).They will be located at 8834 Pico Blvd., next door to MexiKosher. They hope to open soon after the holidays in October. New kosher cafe in Vancouver, Canada opened a few week ago. They are in the Chabad house on 41st Avenue and Oak Street and are the only Cholov Yisrael option in the city. located on East 54th Street, between Park & Lexington Avenue. We hear that an upscale steakhouse will be opening up in the near future near Evergreen Plaza and a shawarma joint will be opening next to 7 Eleven. Stay tuned for more details. The restaurant as well as their catering company is available for sale as a turnkey operation. If you are interested in hearing about the sale details and price, please reply to this email. In our last newsletter we told you about the C&R's 6 Points Bakery that just opened at 289 Montgomery Avenue but now we have another surprise from them. Last week was the final dinner service as Citron+Rose restaurant in Bala Cynwyd. They are introducing a new casual concept (ie. family friendly) and menu this week under the new restaurant name "C&R Kitchen" with exciting new dishes and old favorites. Click here for their menu. And moving forward, you will soon be able to experience Chef Karen's more contemporary cuisine when Citron & Rose opens in a Center City location this coming fall! We highly recommend you make a reservation during this week of their new opening. And click here for a first new look at how "The Dairy" restaurant is coming along. While we are aware of the name, we can't quite reveal it yet. But the restaurant located at 9460 Harding Avenue has been bringing in equipment and taking down the old signs in preparation for the opening, which is targeted by the end of August. Click here for pictures. Chef Shimi Alon's goal has been to bring his passion for food to the south Florida community and has now brought his inspiration to the fast food industry. 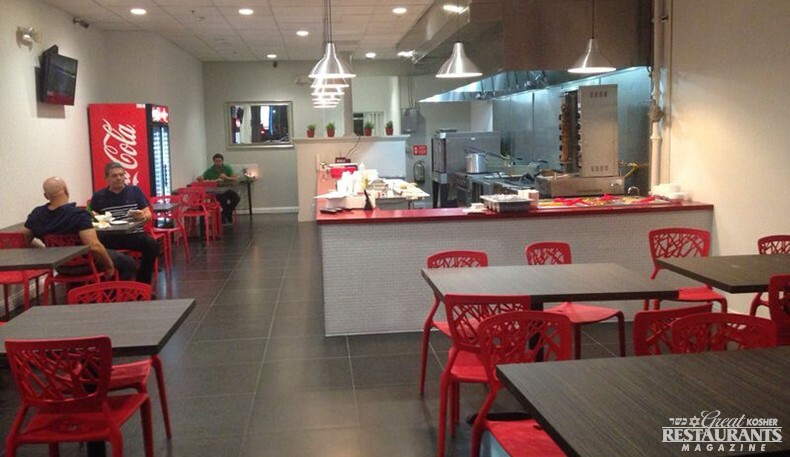 Alon's reputation for quality of food and attention to quality of service in his restaurants has brought a demand for expanding his restaurant's concept to other locations in south Florida, most recently being his new "Grill House Express" located in the Somerset Shoppes plaza in Boca Raton. At Grill House Express his customers can feel right at home and enjoy the quality they have come to know and love from his origins at Grill House Miami's Gourmet Steak House and Sushi restaurant in Miami Beach, Florida. 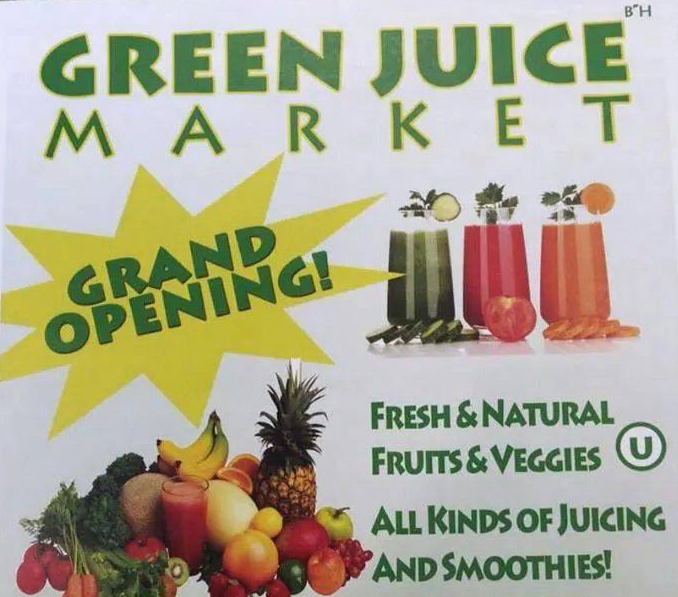 Boasting a Fresh & Natural Store, serving all kinds of Juices and Smoothies. Hours: Mon- Thu 8:30am - 6:00pm, Friday 8:30am - 3:00pm. At 5005 Collins Avenue. Restaurant/Condo Opportunity! Click here for all the details. Stephen Kreisler, general manager of the restaurant, says the plan is to launch the truck in the first week of August. When it's on the streets, expect the Milt's truck to mostly serve a selection of sandwiches from the Kosher restaurant's menu, including brisket, pulled chicken, burgers and hot dogs. Also expect appetizers including a wings (smoked or Buffalo) and sides. Look for it around the city and north suburbs on Sundays through Thursdays, and possibly for Friday lunches. New location at 34 Beit Hadfus, Givat Shaul in Jerusalem still serving their unique products such as Hungarian Salami, German-style Aufschnit, Landjager Sausages and Italian Smoked, Air Dried Entrecote. (New Hours: Mon.-Thu. 11am - 8pm; Fri. 10am - 1pm). Click here for more.